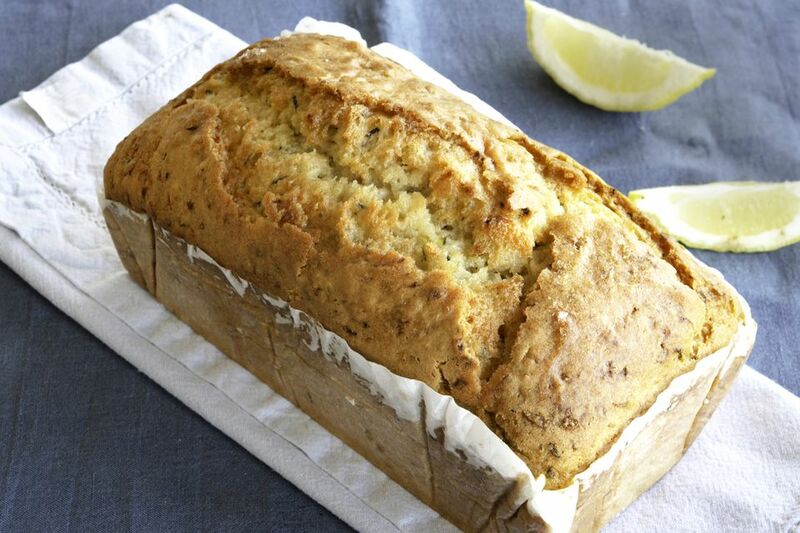 This delicious lemon zucchini bread is the ultimate treat any time of day; yes even for breakfast. The bread is super easy to make in fewer than 15 minutes and it's cooked within an hour. The final soaking with a lemony syrup creates a subtle glaze on the top. This bread keeps well in an airtight container, so it's always ready for snacks, dessert or a slice with a cup of tea. Seriously, what is not-to-like about this lovely bread? Gather your ingredients and preheat oven to 350 F. Grease a 5- by 9-inch loaf pan with butter or use a paper liner. Wrap the grated zucchini in a clean kitchen towel, wring out over the sink to remove extra liquid, and set aside. Whisk together the sugar and the eggs until light and frothy. Add all the lemon zest, half of the lemon juice and the oil and lightly whisk again. Sift the flour, baking powder and soda, salt and whisk thoroughly to combine into a smooth batter. Finally, fold in the grated zucchini. Pour the batter into the prepared loaf pan, tap the tin on the worktop to settle the mixture and release any trapped air bubbles. Bake in the center of the preheated oven for 50 minutes or until a skewer inserted into the loaf comes out clean; if it doesn’t, continue to cook checking every five minutes. While the loaf is cooking, make the syrup by whisking together the sugar and the remaining lemon juice. Not all the sugar will dissolve but do not worry; this creates a lovely crunch on the top. Once cooked, place the hot bread, still in its pan, on a cooling rack. Prick all over with a toothpick or thin skewer and spoon the syrup over allowing each spoonful to soak in before adding another. Cool completely, then lift from the tin and serve. Or, wrap in fresh wax paper and place in an airtight container for a couple of days. If you can, buy large, juicy, wax-free lemons (the zest is used as well as the juice so best without the wax coating). This lemon bread is a classic but that does not mean you can't switch out to other citrus flavors. Use two limes to one lemon, or even all lime but you will need at least four juicy limes. Clementines or blood oranges when in season bring a fresh orangey zing which you will love.